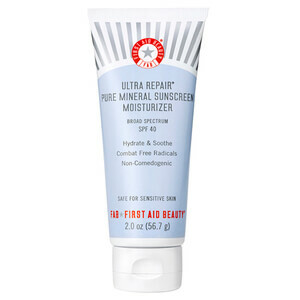 Offering high level UVA and UVB protection, First Aid Beauty's Ultra Repair Pure Mineral Sunscreen Moisturizer SPF40 absorbs quickly into skin to defend against harmful effects of sun exposure. 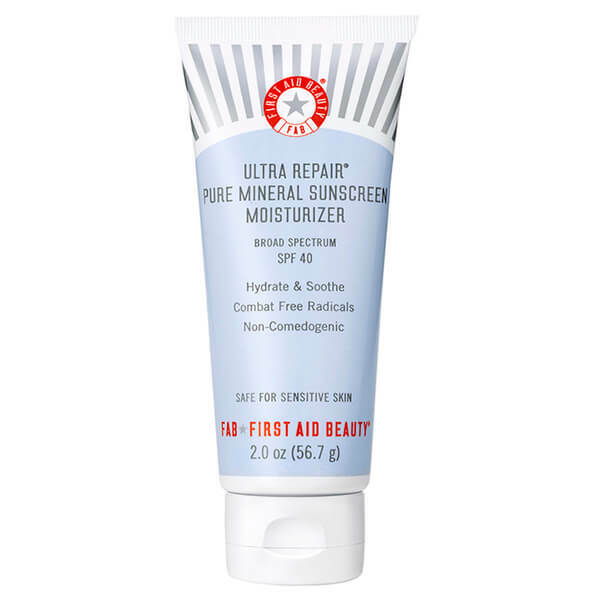 Powered by Titanium Dioxide and Zince Oxide (natural minerals that work to shield from photo-ageing and UV rays), the lightweight, silky formula is safe for all members of the family, and can be used for sun protection from head to toe. Colloidal Oatmeal relieves itchy, dry skin for long-lasting comfort, whilst emollient Shea Butter and Meadowfoam Seed Oil soften, hydrate and protect the skin's barrier function. Fortified with the brand's unique antioxidant booster, the moisturiser combines Liquorice Root, Feverfew and White Tea to combat free radicals, leaving even the most sensitive skin nourished and soothed without sticky, greasy or white residue. No parabens, harsh chemicals or colourants. Apply liberally to face 15 minutes before sun exposure. Reapply after 40 minutes of swimming or sweating. Reapply immediately after towel drying. Reapply at least every 2 hours. Aqua (Water, Eau), Butyloctyl Salicylate, Titanium Dioxide, Zinc Oxide, Caprylic/Capric Triglyceride, Steareth-2, Cetearyl Alcohol, Dimethicone, Squalane, Glycerin, Butylene Glycol, Alumina, Ceteareth-20, Avena Sativa (Oat) Kernel Flour, Urea, Allantoin, Butyrospermum Parkii (Shea) Butter, Copaifera Officinalis (Balsam Copaiba) Resin, Limnanthes Alba (Meadowfoam) Seed Oil, Persea Gratissima (Avocado) Oil, Chrysanthemum Parthenium (Feverfew) Extract, Camellia Sinensis Leaf Extract, Glycyrrhiza Glabra (Licorice) Root Extract, Ceramide 3, Tocopheryl Acetate, Triethoxycaprylylsilane, Caprylyl Glycol, Isopropyl Titanium Triisostearate, C13-14 Isoparaffin, C12-15 Alkyl Benzoate, Polyhydroxystearic Acid, Laureth-7, Methicone, Leuconostoc/Radish Root Ferment Filtrate, Xanthan Gum, Polyacrylamide, Phenoxyethanol, Disodium EDTA, EDTA.